Cadiz, one of the oldest cities not only in Spain but also in Europe, is first of all a perfect choice for anyone seeking cultural pleasures. You would be surprised to know the history written in the walls of Cadiz. For example, it was from this ancient Atlantic port that Cristopher Colmbus set sail from Cadiz on his second voyage. Despite all the marvels and treasures hidden in the mystique centre of Cadiz, not a great deal of tourists can be found here. That may be good if crowds put you off. One of the reasons behind Cadiz low tourist profile is it’s isolation. The city center is located on a peninsula which can be accessed from one direction only. Check our guide with all the practical information, handy tips and opinions on holidays in Cadiz, Spain. Read about top attractions, recommended places to stay and best things to do in Cadiz. Get to know the best restaurants in the capital of Costa del la Luz, Cadiz. Plan and book your vacations online today with Best Andalucia guide. 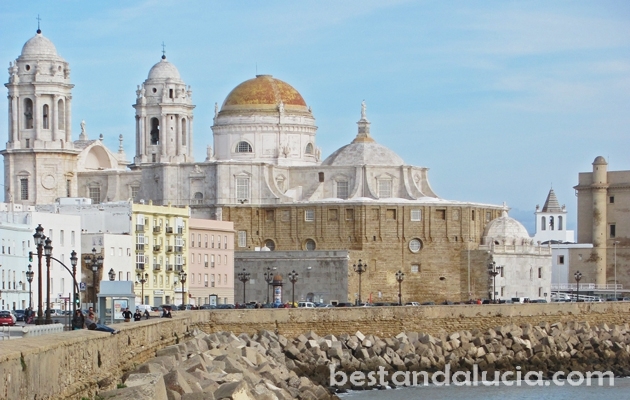 Cadiz is one of the best place for short cultural holidays. In summer it’s a top destination for family holidays. Find top hotels in Cadiz, Spain, to get the best hotel deal for your stay. Check hotels in Cadiz in Andalucia offering good value for money. Pick the hotel that best suits you and your budget. Find and rent houses, villas and apartments for summer holidays in Cadiz, Spain. Choose from the best variety of properties. Luxury holiday homes with private pools, sports facilities and more. Enjoy spectacular holidays in Cadiz, Andalusia.